We are delighted to have Author Dawn Byrd with us today. Dawn tell us, how did this story come to you? That’s interesting. Please tell us more about the journey to getting this book published. I’m sure our readers would like to know more about you. Please tell me three things about yourself that would surprise your readers. We have two things in common, I love dogs and sour things. So tell us, What is your favorite writing tip? Write something every day. All of my books are written in 30-day marathons. I decide how many words I want to write in 30 days and map them out on a calendar, so I can keep track of where I am and where I need to be. I totally agree. So, what are you working on now and what’s next for you? I’m working on my December release, which is the third book in the “Identity Series.” It’s called Double Identity and is about two seventeen-year-old identical twins who never knew about each other. One, raised by her mom, is a Christian, the other, raised by her father is a wild child. When the two meet up and the wild one falls for the Christian one’s boyfriend, sparks of the worst kind begin to fly. It was a pleasure having you with us today. Any parting comments for our readers? Zoe is thrilled when she lands her first paying case until she learns she’ll be going undercover at a local blood bank. The fact that she faints at the sight of blood makes working there more than difficult. Who would steal blood and what would they do with it? Is her creepy vampire-like coworker using it in a cult ritual? When Zoe learns that Nate will be working undercover with her, she’s overjoyed. 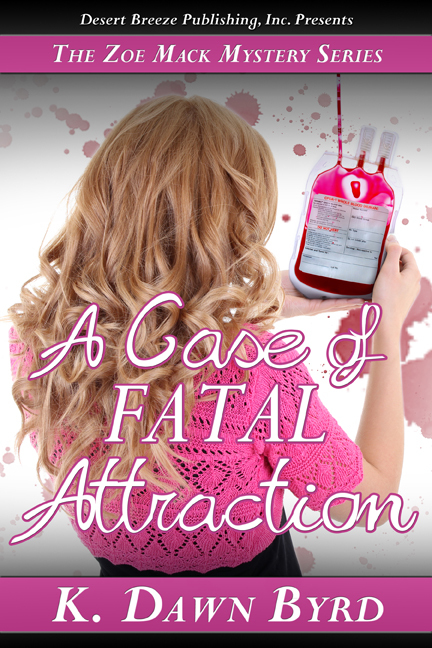 She soon finds that the gorgeous Rikki’s attraction to Nate is too distracting and considers throwing him off the case. Zoe questions his loyalty even as Nate proclaims that she’s the only girl for him. Nothing is as it seems and Zoe has no clue who can be trusted. Who’s stealing the blood? Is it the director? The vampire-like guy with the fangs who wears all black? Or, her gorgeous co-worker who has a thing for Nate? When painting with words…expect the unexpected! Delighted! to hear more about your new book!